The health or medical industry is a sector within the economic system that provides services and goods to people with health concerns. The health or medical industry in the Philippines is expected to deliver, in a collective effort, excellent services and products to the community. The first question is, when does one say that the health industry in the Philippines is delivering service excellence? What criteria and indicators do we use? 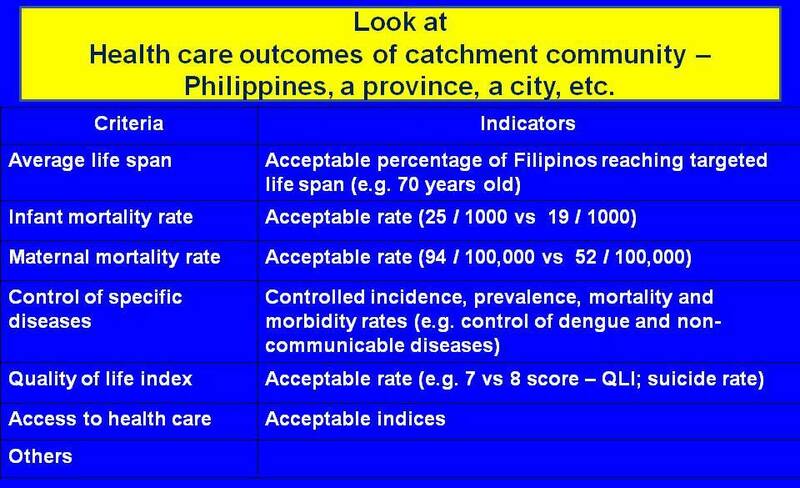 My most direct answer to this question is to look at the current health care outcomes of the catchment community of the health industry, such the Philippines, a province, a city, etc. Examples of criteria for health care outcomes are the average life span; infant and maternal mortality rate; control of specific diseases; quality of life index; and access to health care with their corresponding indicators. The question to ask is: Are the set and agreed indicators being achieved or not? If yes, the whole health industry is delivering excellent services. If not, it is not excellent or not so excellent. Focusing now on the hospitals, the second question to ask is when does one say that a hospital is delivering service excellence? Or what makes a hospital excellent? 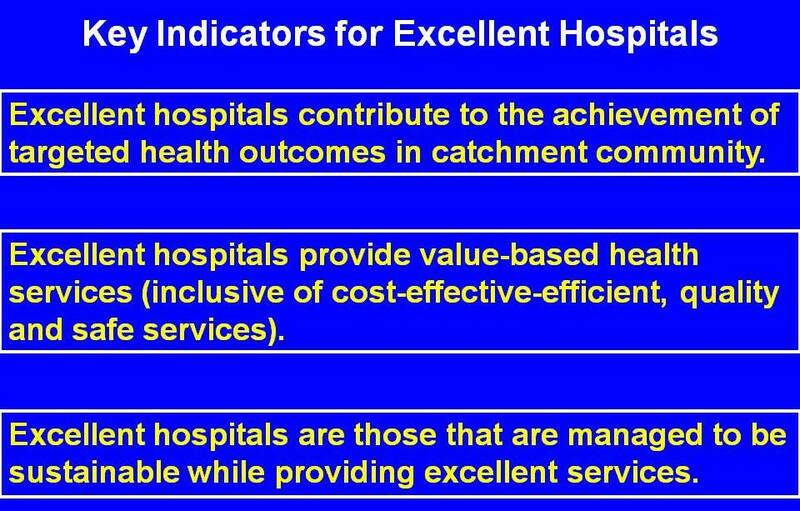 Excellent hospitals contribute to the achievement of targeted health outcomes in catchment community. Excellent hospitals provide value-based health services (inclusive of cost-effective-efficient, quality and safe services). Excellent hospitals are those that are managed to be sustainable while providing excellent services. 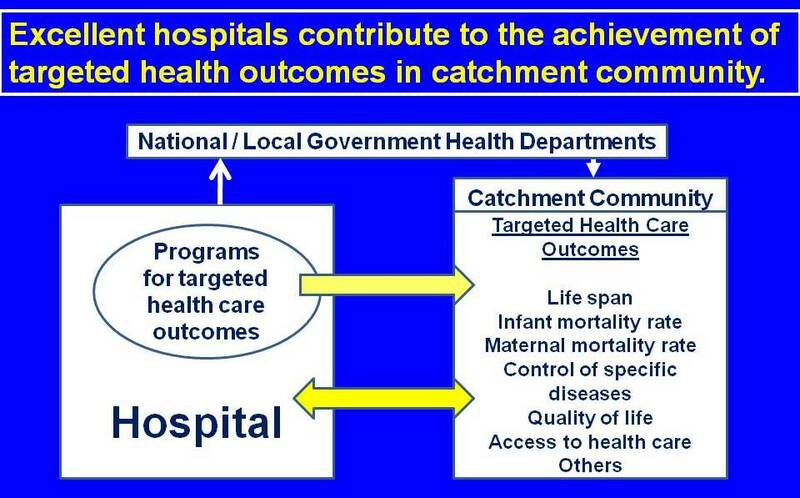 Hospitals can and should contribute to the achievement of targeted health outcomes in their catchment community. They should coordinate and collaborate with the national and local government health departments. They should come out with structured programs to achieve the targeted health outcomes of their catchment community that are aligned and integrated with those of the government health departments. They should track and evaluate their outputs. These activities, if present, constitute foremost evidences of service excellence for the hospitals. 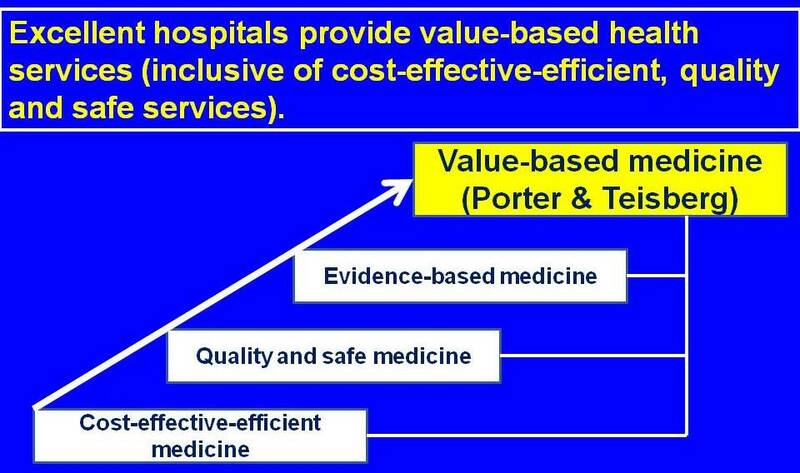 The practice of medicine is now evolving from simply cost-effectiveness-efficiency targets, quality and safe targets, evidence-based medicine to a higher level of service excellence, that of value-based medicine, a concept popularized by Porter and Teisberg. The focus is on value. Value is created for and appreciated by patients served and for services rendered. Value = health outcomes achieved per peso spent, not just access, convenience, volume, and cost containments. In other words, there must be good results on community and individual patient indices and quality and safe services with reasonable costs and expenses. 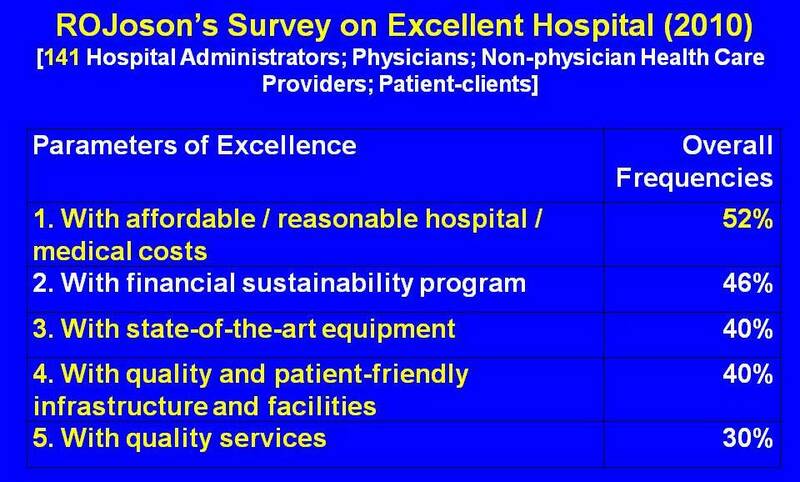 At this point, I will share with you some results of a survey that I did in 2010 on the perception of 141 hospital administrators, physicians, nurses, and patients on what constitute an excellent hospital. In the table are the top 5 parameters of excellence as perceived by the different stakeholders. Note the ranking of affordable / reasonable hospital / medical costs. Note the presence of quality expectations from the stakeholders in rows Nos. 3 to 5. If we combine expectations in rows 1, 3, 4, and 5, we can deduce that the stakeholders wish for value-based services somehow. In this table, one sees in No. 2 slot, “with financial sustainability program” as a parameter of excellence. To this, I agree and this is third criterion that I will use to say that a hospital is an excellent hospital. 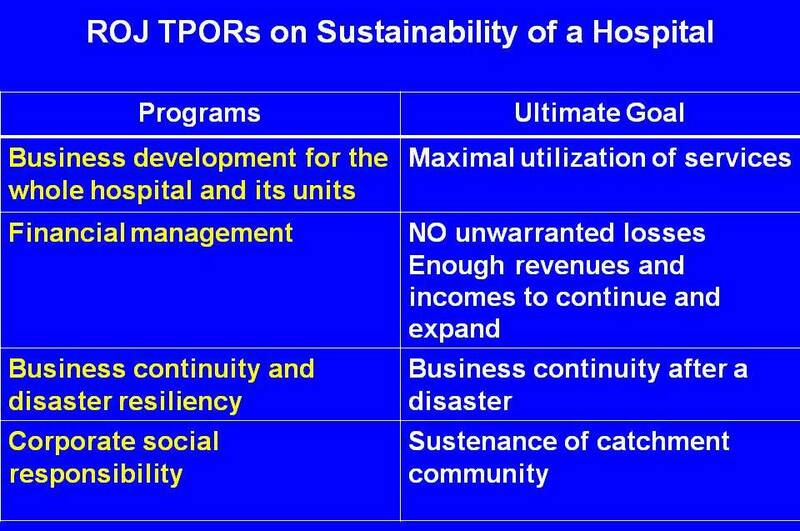 A hospital is sustainable if it has the ability to continue to achieve its operating objectives and fulfill its mission over the long term, say, at least 100 years, and is resilient over time! **See Internet for details on Baldrige Health Care Criteria for Performance Excellence; Joint Commission International; Accreditation Canada International; Investors in People. 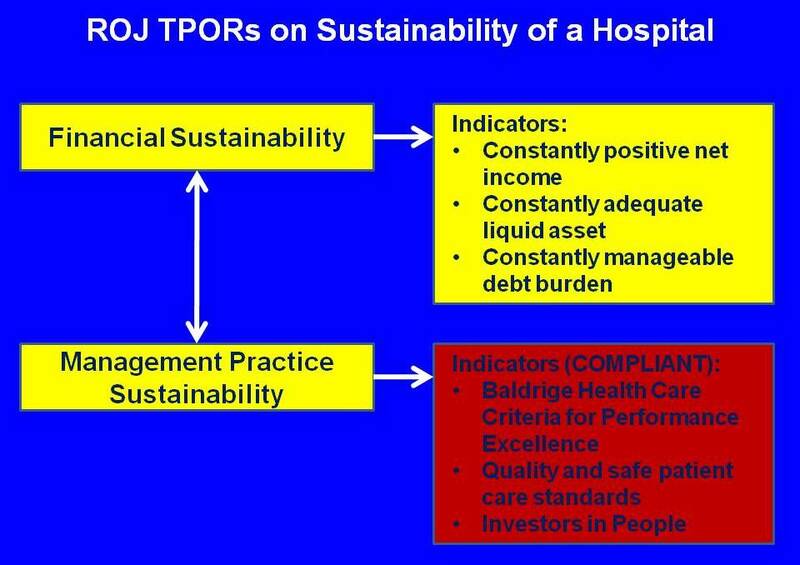 Sustainability of a hospital is dependent on both financial and non-financial factors for which I will use the terms financial sustainability and management practice sustainability respectively. For management practice sustainability, I will suggest the use of the Baldrige Health Care Criteria for Performance Excellence; quality and safe patient care standards, such as those of Joint Commission International, Accreditation Canada International, and PhilHealth Benchbook; and Investors in People. There are at least 4 programs to develop with regard to sustainability. The ultimate goal of the business development program is maximal utilization of services being offered. For the financial management program, no unwarranted losses and with enough revenue and income to continue operations of existing services and to expand when needed. For business continuity, to be able to continue to operate after an unavoidable incident or business disruption such as a fire and earthquake disaster. For corporate social responsibility program, to contribute to the sustenance of the catchment community of the hospital as sustainability of the community will invariably affect the sustainability of the hospital. The third question to ask is what are some recommended strategies in delivering service excellence in hospitals? Set the 3 key indicators of an excellent hospital as goals. Design and develop a hospital performance excellence program always using the 3 key indicators as the steering wheel. Get committed support of top management and staff. Evaluate the results of implementation. Continually improve the program until the 3 key indicators of performance excellence are achieved to the highest degree. 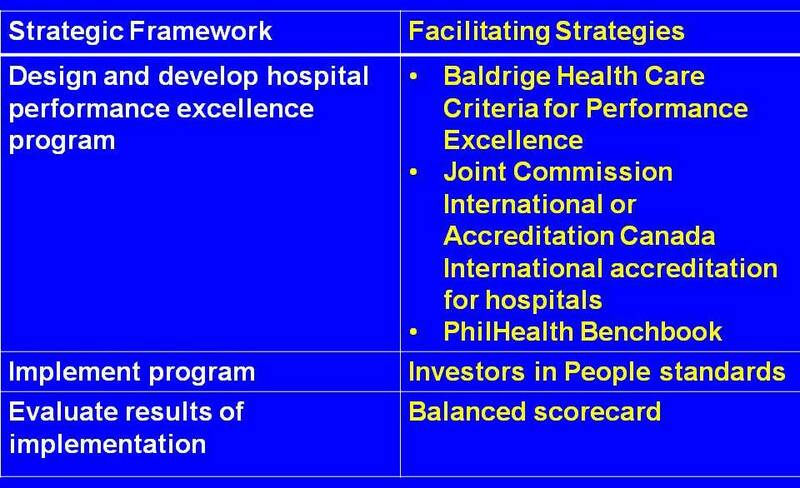 Baldrige Criteria for Performance Excellence, Joint Commission International or Accreditation Canada International for hospital accreditation, and PhilHealth Benchbook, in the design and development step. Investors in People, in the implementation step. Balanced scorecard, in the evaluation step. Note: One needs not go for accreditation to all the standards. What is more important is to be able to use them as guides in implementing and evaluating the hospital performance excellence program. The fourth question to ask is what are the challenges in delivering service excellence in hospitals? There are a lot of challenges in delivering service excellence in hospitals. 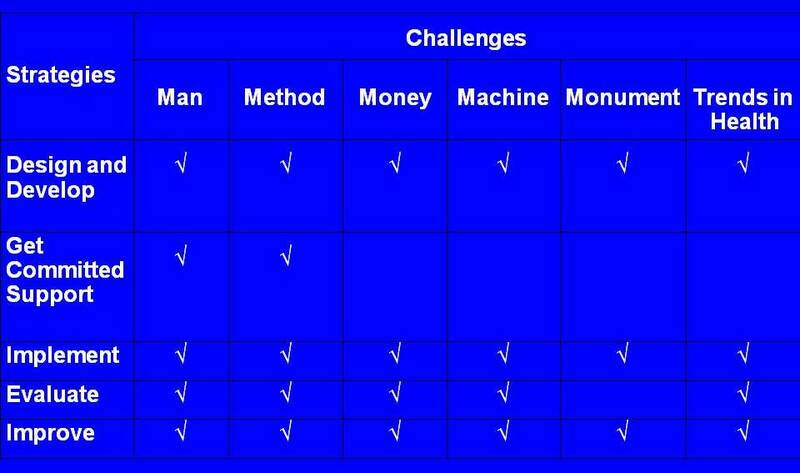 The traditional ones, as seen in the table, are categorized under man, method, money, machine, monument, and rapidly changing trends in health care. 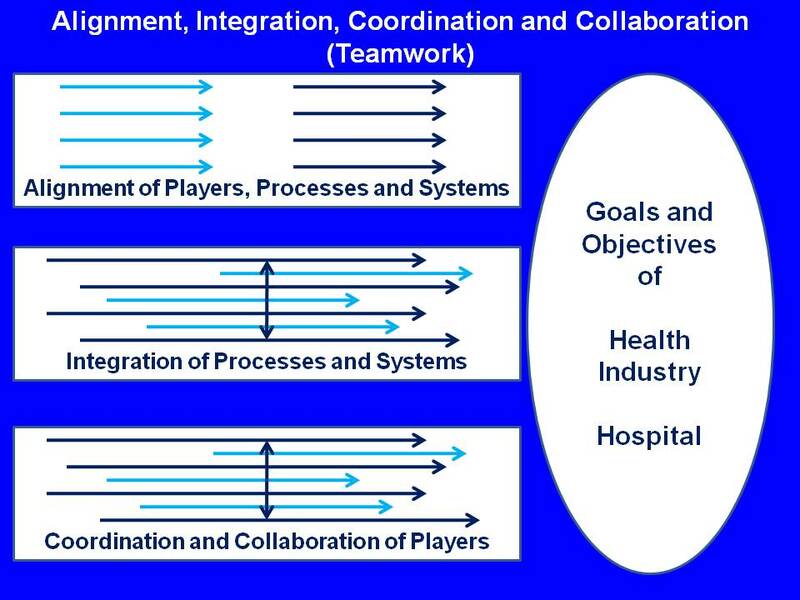 towards achieving the goals and objectives of the health industry and the hospital. 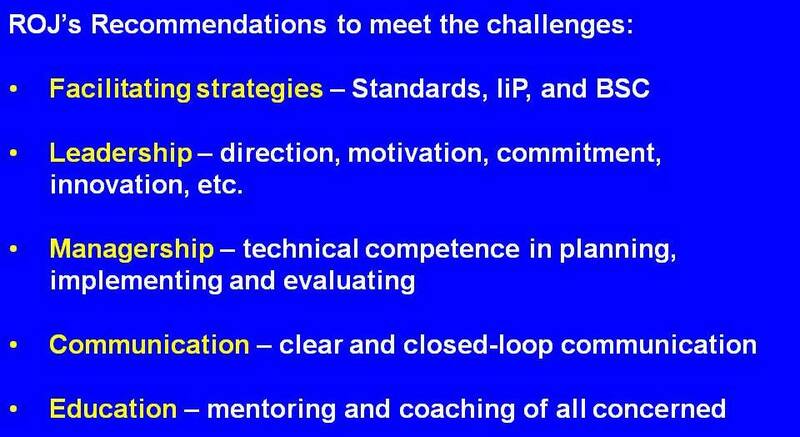 My recommendation: the facilitating strategies that I mentioned earlier, that is, the use of established standards, the IiP, and the balanced scorecard, plus the following generic strategies can be used to meet the challenges. Why deliver excellent service in health industry? Health industry and its components owe it to the clients they have decided to serve. They should do what is right for their clients. With excellent service, with value-based services, there will be more clients, there will be maximal utilization of services, and in the end, there will be enough revenues and incomes to continue to operate and to expand when and as needed. With a social vision, with a corporate social responsibility, there will be sustainability of the catchment community and, in the end, sustainability of the hospital. For those who will manage a performance excellence program in a hospital, I advise you to start early as the journey is long and tedious. You have to be very very perseverant as there are a lot of challenges and things to learn. This entry was posted in Excellent Hospitals. Bookmark the permalink.